Discover Fan Ho – the Hong Kong master photographer exhibits at the 10th edition of the Angkor Photo Festival in Siem Reap! Since November 29, Siem Reap lives in the rhythm of the 10th Angkor Photo Festival. The event is aimed to promote young talents in photography throughout Asia. The most interesting works of Cambodian, Laotian, Chinese photographers are exhibited all over the city. Besides, the festival organizes screenings and workshops for young photographers and also runs 14 different other exhibitions. One of the most notable side event is the exhibition of the famous Chinese photographer Fan Ho with his black and white captures of Hong Kong in the 1960ies. The festival will close on the 6th of December with a screening of the best works of 13 artists exhibited this year. Photographs of Fan Ho, one of the most famous Chinese photographers, are currently exhibiting at Angkor Photo Festival in Siem Reap. Born in 1937 in Shanghai, he immigrated with his family to Hong Kong. He has discovered a passion for photography very early: he was still a child, when he was roaming the streets of Hong Kong with his father’s present – a Rolleiflex camera. His black and white captures of Hong Kong made him the most famous Chinese photographer in the world. He won more than 280 awards from different art festivals all over the world. 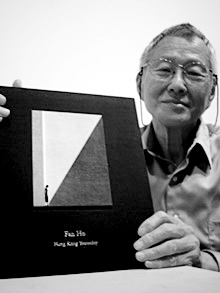 Fan Ho is also a famous Hong Kong film director. The festival will close on the 6th of December with a screening of the best works of 13 artists exhibited this year. The best exhibition of the fesival.